Thousands of acres of Palestinian agricultural land have been razed and uprooted by Israeli occupation authorities. 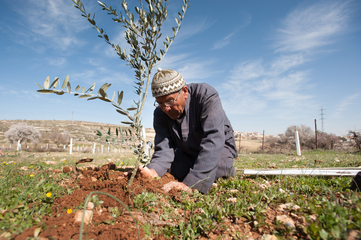 The One Million Tree Campaign replants trees and supports Palestinian farmers to maintain ownership of their land and livelihoods. Israel has long employed a variety of tactics in order to seize private Palestinian land for Jewish settlements. In 1950, Israel enacted The Absentee Property Law, which gives the Israel the ‘right’ to seize, administer and control land owned by absentees. In the 1980s, Israel started implementing an 1850 Ottoman law, which states that any plot of land which has not been cultivated for three years, or has less than half its area cultivated must be reverted to the Ottoman sultan, or to the state in the case of Israel. While this law was originally enacted to encourage farmers to use their land, it has been manipulated by Israeli occupation authorities to facilitate land grabs. As a result, Palestinian land is constantly under threat of confiscation and in order to facilitate the expropriation of occupied land, thousands of acres of Palestinian agricultural land have been razed and uprooted by Israeli authorities. This has paved the way for the expansion of illegal settlements, the building of settler-only roads and the extension of Israel’s separation (Apartheid) wall; the construction of the wall, which began in 2000, resulted in the uprooting of an estimated 100,000 trees. Hundreds of families have been displaced and vital transportation routes have been disconnected. Since 2000 over 3 million trees have been uprooted, most of which are olive trees. There have been numerous accounts of settler violence resulting in the burning, vandalism and poisoning of Palestinian-owned trees. 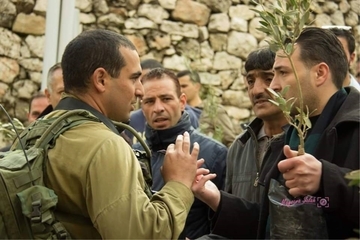 While an estimated 90 percent of Palestinian communities own olive groves within, or around, Israeli settlements, they are frequently denied access to their own agricultural land by the Israeli occupation authorities under ‘security reasons’. If granted access permits, which often requires proof of ‘connection to the land’, Palestinians must cross designated gates and checkpoints, which are usually only open during the olive harvest period and for a limited amount of time, making it difficult to carry out essential agricultural activities such as fertilizing and pest and weed management, causing potential yield drops. This causes massive disruptions to Palestinian livelihoods as nearly half of the agricultural land in the Occupied Palestinian Territories is planted with olive trees. The olive oil industry, including olive oil and its by-products, and table olives, supports between 800,000 and 100,000 Palestinian families and is worth between US$160 and US$191 million. 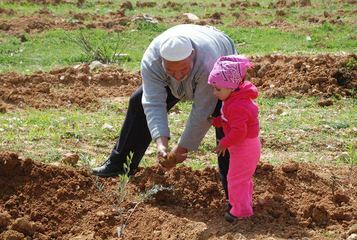 The clearing of and restrictions on access to agricultural land are thus a direct threat to the many Palestinian families who rely on agriculture as a vital source of food and income. One third of all women in the occupied Palestinian Territories, for instance, are employed in the agricultural sector Moreover, Palestinians have relied on olives for centuries, and the strategic targeting of Palestine’s emblematic olive groves is also an attack on identity, culture and heritage. In 2004, the International Court of Justice ruled that Israel is obliged to return the land and olive groves seized for the purpose of the construction of the wall to the Palestinian owners. Yet, despite the obligation of Israel, as the occupying power, to meet international law in protecting Palestinian civilians and land, the Israeli occupation authorities and illegal settlers continue to operate unabated with rare indictment or accountability. Project Details In response to the stark injustice faced by Palestinian farmers and land owners, Arab Group for the Protection of Nature launched the One Million Trees Campaign (MTC) in 2001 with a focus on replanting tree seedlings and supporting farmers in maintaining ownership of their land and avoiding confiscation on the basis of the old Ottoman law enacted by Israel. Since the project’s initiation, over 2 million trees have been replanted, over 100,000 dunams have been rehabilitated and over 23,000 farmers have been successfully targeted. The work was executed in collaboration with several partners in Palestine. Development of Alternatives The case of uprooting and razing agricultural land is one of extreme violations of human rights and international law. 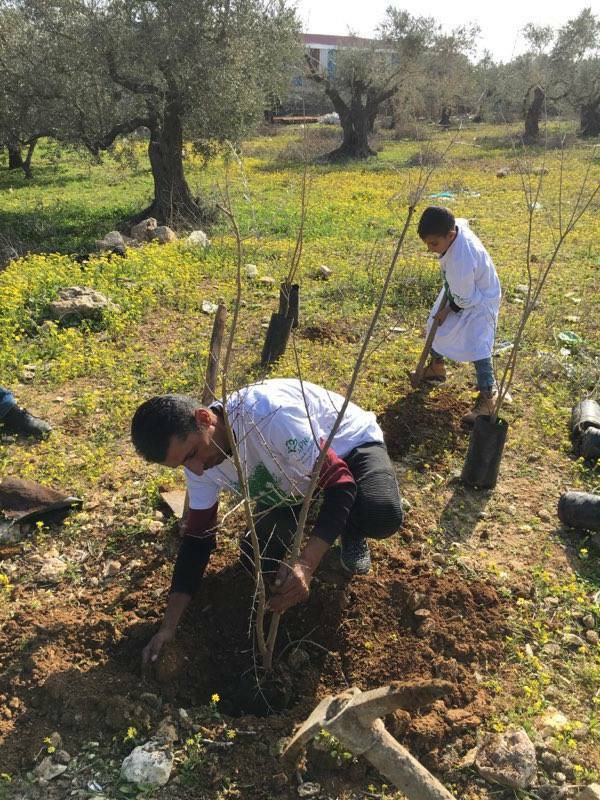 By preventing the uprooting of trees and the subsequent confiscation of land, culture and history, the Million Tree Campaign is an active alternative to the injustice faced by Palestinians. However, Israel also has an obligation to give Palestinians their right to access just and fair redress and effective remedy, and ultimately, the only long-lasting alternative is an end to the occupation. Why? Explain briefly. Although the Israeli occupation authorities continue to operate with complete impunity and no indictment, the replanting of trees and the rehabilitation of razed agricultural land are a means of resistance against the expropriation of Palestinian land and the expansion of illegal Israeli settlements. To ensure the sustainable success of the campaign, APN has extended its services beyond the replanting of trees by installing irrigation networks, building water collection systems and providing water tanks for farmers. The replanting of trees is an all-encompassing campaign as it not just provides an additional source of income generation for vulnerable families, but is also a means for achieving sustainable food sovereignty. 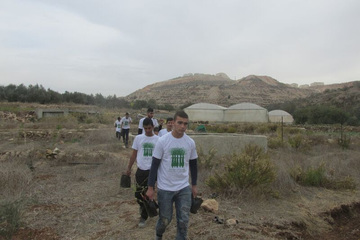 The campaign deepens the roots of threatened Palestinian tradition and heritage and raises awareness at the local and international level on the violations of human rights committed by illegal Israeli settlers and the Israeli occupation authorities. 3RP, 2017. Regional Refugee & Resilience Plan 2017-2018 In Response To The Syria Crisis, s.l. : s.n. Anon., 1950. Absentees' Property Law, 5710-1950. Jerusalem: Knesset. Bishara, S., 2009. Letter Regarding Absentee Property. s.l.:Adalah. El-Jazairi, L., 2010. The road to olive farming: Challenges to developing the economy of olive oil in the West Bakn, s.l. : Oxfam. Falk, R. & Tilley, V., 2017. Israeli Practices towards the Palestinian People and the Question of Apartheid, Beirut: United Nations. FAO, 2011. The State of Food and Agriculture , Rome: s.n. FAO, 2013. Governing land for women and men: A technical guide to support the achievement of responsible gender-equitable governance of land tenure, Rome: s.n. Forman, G. & Kedar, A., 2004. From Arab Land to 'Israel Lands': The Legal Dispossession of the Palestinians Displaced by Israel in the Wake of 1948. Environment and Planning D: Society and Space, 22(6), pp. 809-930. Habitat International Coalition, 2009. The Human Rights Dimensions of Land Middle East/North Africa: Dispossession, Displacement and Development Alternatives, s.l. : s.n. Haddad, F., 2014. Rangeland resource governance - Jordan. In: P. Herrera, J. Davies & P. Baena, eds. The Governance of Rangelands: Collective actions for sustainable pastoralism. s.l.:Routledge. IFAD & GLTN & UN Habitat, n.d. Women's access to land in sub-Saharan Africa, s.l. : s.n. Liston, G., 2013. The historical context of the Israeli land and planning law regime. Mondoweiss. Mair, L. & Long, R., 2003. Backs to the Wall, s.l. : s.n. Matar, I., 1997. The Quiet War: Land Expropriation in the Occupied Territories. Palestine-Israel Journal of Politics, Economics and Culture, 4(2). Ministry of Agriculture Palestine, 2009. Losses and Damages, s.l. : s.n. Namubiru-Mwaura, E., 2014. Land Tenure and Gender: Approaches and Challenges for Strengthening Rural Women's Land Rights, s.l. : The World Bank. OCHA, 2017. Humanitarian Needs Overview: Yemen, s.l. : s.n. Palestine Liberation Organization , 2005. Israel's Continuted Land Confiscation in Jerusalem: The Application of Israel's Absentee Property Law, s.l. : s.n. Reytar, K., Veit, P. & Tagliarino, N., 2016. Indigenous Land Rights: How Far Have We Come and How Far Do We Have to Go?, s.l. : World Resources Institute. Schoneveld, G., 2016. Host country governance and the African land rush: 7 reasons why large-scale farmland investments fail to contribute to sustainable development. Geoforum. UN Habitat, n.d. The Right to Adequate Housing: Fact Sheet No. 21, s.l. : s.n. United Nations Human Rights, 2003. Right to Water: Fact Sheet No. 35, s.l. : s.n. United Nations Human Rights, n.d. The Right to Adequate Food: Fact Sheet No. 34, s.l. : s.n. United Nations Office for the Coordination of Humanitarian Affairs , 2012. Olive Harvest Factsheet, s.l. : s.n. United Nations Office for the Coordination of Humanitarian Affairs, 2017. The Monthly Humanitarian Bulletin , s.l. : s.n. United Nations, 2013. Rural Landless and Land Poor, s.l. : s.n. United Nations, n.d. Sustainable Development Goals: 17 Goals to Transform Our World , s.l. : s.n. UNRWA, 2013. Olive harvest: continued settler attacks against refugee livelihoods, s.l. : s.n. Wickeri, E., 2011. Land is Life, Land is Power: Landlessness, Exclusion, and Deprivation in Nepal. Fordham International Law Journal, 34(4). Wickeri, E. & Kalhan, A., 2011. Land Rights Issues in International Human Rights Law, s.l. : Institute for Human Rights and Business . Zimmermann, W., 2011. Towards Land Governance in the Middle East and North Africa Region, s.l. : FAO. Mohammad Jamal is one of the beneficiaries of the tree and vegetable planting project in Beir Surik, near Jerusalem. 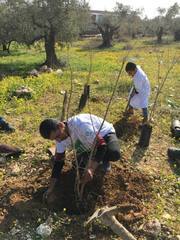 The project (2016-2017) targets farmers across villages near Jerusalem by distributing over 13,000 fruit trees, and was sponsored by the International Islamic Charity Organization in Kuwait, in collaboration with 'Wakf Al Quds' in Lebanon, the Arab Group for the Protection of Nature and the Rural Revival Group in the North Western villages of Jerusalem. Mohammad Jamal inherited a profound love for the land from his father and grandfather, and refused to give in to pressures and challenges he faced. He was adamant to farm on it to avoid confiscation, and with the help of the donation, he planted a variety of fruit trees, vegetable seedlings and herbs that now bring him a sustainable source of income.